Manufacturers are in a constant struggle for efficiency and automation is their weapon of choice. How can a manufacturer integrate automation quickly and easily for the fastest possible implementation and ROI? Dynamic Group, a medical devices and precision products manufacturer from Ramsey, MN, asked themselves these same questions regarding their injection molding and packaging applications. “The main reason we automated was due to the shortage of qualified labor in our area. That can be great for employees looking for work, but difficult for employers looking for staff,” said Joe McGillivray, CEO of Dynamic Group. Without any experience in using robotic automation, McGillivray was initially hesitant about adopting technology. Braas is a distributor and reseller of industrial automation, and provided Dynamic Group with a demo unit of Universal Robots’ (UR) UR10, which they eventually purchased. Today, Dynamic Group uses three different UR robots for three different applications. Dynamic Group has been using their collaborative robots for just over a year and have not experienced any failures. Dynamic Group’s situation was an ideal one for automation, and should be considered a best case scenario. More often than not, manufacturers will be required to work closely with integrators authorized by their automation provider of choice. These teams are located across the country and are professionally trained to integrate, program, maintain and troubleshoot systems by one or a collection of providers. For an integrator to receive authorization from FANUC America, they are required to go through a series of training programs and seminars. Delta Technology is counted among FANUC America’s trained, authorized integrators. “FANUC offers many opportunities for us to tap into training, applications, simulations and seminars that give us the tools that ultimately lower project risk for our clients,” said Lyle Rusanowski, CEO at Delta Technology. Rusanowski emphasizes that manufacturers must understand their application when approaching an integrator. Integrators establish what in their customer’s process may need to be improved or corrected over a series of interviews, both over the phone and on the facility floor. The integrator’s engineering team can begin assessing feasibility, budgetary costs and design concepts after these initial steps. The customer and integrator develop a relationship throughout the entire process which can help speed the process along. Customers without a clear idea of what exactly they need will be required to interact more closely with their integrators. This may lengthen the integration process, but will provide more opportunities for each partner to understand the other’s needs and therefore result in a more effective integration process. Although most automation providers have a network of authorized integrators across the country, some companies have the capability to provide turnkey solutions. Customers can approach local turnkey companies to both purchase a solution and organize its integration. Mazak Corporation, for example, established Mazak Automation Systems in Florence, Kentucky for this purpose. Mazak Automation Systems requires customers to fill out an automation questionnaire to determine the nature of their process and what exactly they desire from their automated cell. Robinson recommends that during the integration process, a manufacturer appoint a point person to interact with their integrator. This champion of change embraces the new technology on behalf of the staff to mitigate any downtime a facility may experience during the integration process. The point person is informally taught much of the programming and maintenance involved in the integrated solution. He or she would also be taught how to perform troubleshooting processes, and will represent the facility if the integrator is ever required to return to help solve more serious issues with the system. When looking to integrate any automation solution, it’s important to know that not every solution has the same requirements. For example, when looking at the difference between collaborative and conventional robots, each requires different considerations for floor space, safety requirements and training. If a manufacturer wishes to integrate a robot, a safety and risk analysis is necessary. Conventional robots are typically isolated from facility personnel inside a gate. The most common examples of this type of automation can be found in the automotive industry. 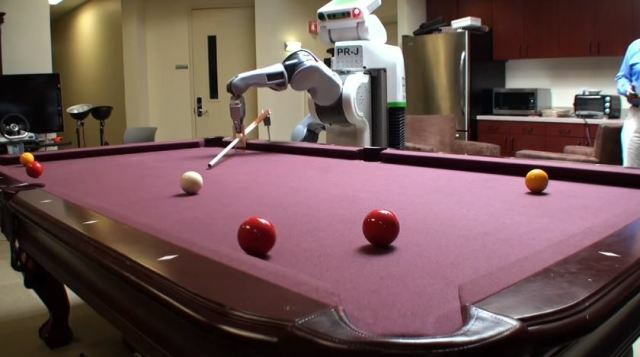 In these situations, human interaction with the robots is ideally slim to none, allowing for relatively easy integration assuming the required floor space is available. With complexity comes a greater chance of something going wrong with the circuit, Krzmarzick adds. These scenarios require greater care and time to integrate efficiently. If a manufacturer is considering a collaborative robot as a solution, safety and risk analyses must determine whether a collaborative unit is right for the application before integration can begin. The payload, its required elevation, end effectors and the size of the robot are all factors that determine whether a collaborative robot could be used. If a collaborative robot is integrated, parameters such as the maximum velocity and collision sensitivity must also be taken into consideration in order to prevent injury to nearby operators. A significant difference in the integration process with collaborative robots is the ease of integration some units can provide. Collaborative robots like those from UR are designed for ease of use and programming. Someone without previous knowledge of robot programming could quickly guide a robot arm like the UR10 through a set of motions to begin operating on a process, rather than punch complicated code through an HMI. Rethink Robotics, another leading collaborative robot supplier, also offers ease of programming with their borderline-humanoid robots Baxter and Sawyer. 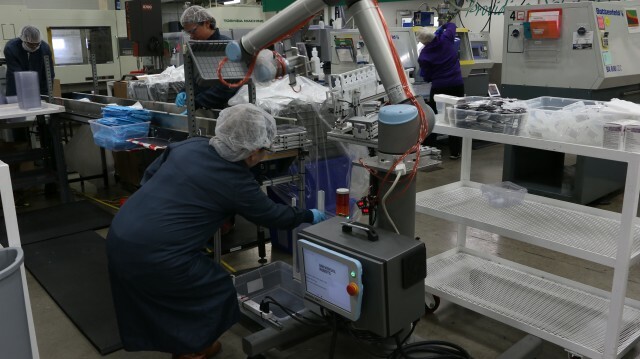 “Ease of programming opens up a whole new opportunity for small and mid-sized manufacturers that don’t have the budget for a system integrator or IT team to deploy traditional robots,” said Carl Palme, product manager at Rethink Robotics. “Our hardware and software are designed to reduce integration complexity as much as possible,” Palme continued. However, there are still challenges for manufacturers with a complex process. “A lot of the time, you get into problems where you need to figure out how you’re going to orient the robot in relation to the part, or how the part is going to be presented,” Mabie explained. Many collaborative robots can be mounted upside down, on an angle, or from walls, desks or mobile platforms. This can sometimes present an overwhelming number of options. This complexity in positioning can have a beneficial or detrimental effect on the programming stage for your application. Mabie compares the process to playing pool. Correctly orienting the arm, wrist and elbow of the robot can allow for fast and tight passes around corners and under obstructions to increase production speed. UR offers classes covering everything from basic programming, to replacing joints in a collaborative robot arm. Rethink Robotics offers virtual training resources and hosts a wiki to provide tutorials and videos on integration. For those looking to integrate for the first time, or those brushing up on the basics for their next project, it’s important to know your application and the problems you aim to solve in your current process. It’s wise for a manufacturer to bring their operators and managers into the process to help them understand the application, how automation may or may not improve it and if so, how to keep it running smoothly. It is also important to let employees know they will not lose their jobs. Employees whose positions are due for automation can become a part of the integration process and upgrade their skill sets to include robot programming and maintenance. Employees will become more valuable, processes will become more efficient and manufacturers will see optimized ROIs when working with the right integrators and automation suppliers. For more information on industrial automation, continue reading with us about Why You Should Automate with Industrial Robots. For the latest news on automation and industrial robotics, follow us on Twitter.